What biotin can do for your tresses is a well-known secret. It’s always been known but with the surge of natural hair, it’s become a go-to for healthier hair growth among naturals. Biotin is a coenzyme and vitamin B or vitamin H. It’s not just for hair growth, as it’s sometimes used for diabetes and supports the health of skin, nerves, digestive tract, metabolism and cells. It’s found naturally in eggs, brewer’s yeast, cauliflower, and cucumbers. It’s been called “hair food” since it improves the health and strength of your incoming strands. The commonly suggested dosage is 5000 mcg a day as a supplement, but even if you don’t want to pop a pill or feel you are not getting enough of it in your diet, you can just buy it in your hair products. Check out these top 14 shampoos with biotin. 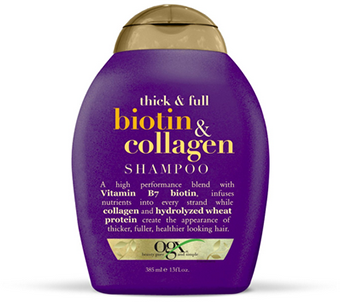 The biotin in this thick shampoo is coupled with collagen for double benefit. You get the ProVitamin B7 (biotin) that infuses into your hair strands while the collagen adds volume and dimension to give you thicker, fuller looking hair. When you add the hydrolyzed wheat protein for strength your hair is left fuller, thicker, and healthier. This is the perfect shampoo for removing excess sebum and infusing biotin into your scalp and pores. The revitalizing botanicals, amino acids, and nutrients make this shampoo perfect for fine, fragile, and thinning hair. The amino acids, DHT inhibitors, and biotin make this an ideal shampoo for promoting hair growth. Limp, thinning hair gets a boost with this scalp stimulating Biotin B-Complex therapy shampoo. It cleans while nourishing the hair from the follicle through the entire hair shaft. Your strands are strengthened while enhanced to give a fuller effect. This shampoo is fortified with biotin, saw palmetto, and wheat protein to help control hair loss while the B-Complex helps healing damaged tresses. Here is an herbally infused ayurvedic shampoo that’s enhanced with biotin and aloe vera. The biotin strengthens your hair and balances the pH levels while the aloe vera moisturizes and reduces inflammation and dandruff. You get a gentle cleaning shampoo for delicate and sensitive scalp and hair. Biotin gets combined with keratin, elastin, and cysteine to provide healthier growing tresses. The peppermint oil provides a stimulating sensation for your scalp while the therapy formula gives your hair the full-bodied texture it craves. A stimulant for weak hair, this biotin strengthening shampoo has seven nourishing, healthy hair nutrients that will make your hair vibrant and feel stronger. Soy proteins and panthenol to strengthen, jojoba oil will moisturize, amino acids fortify, biotin, and folic acid help to grow hair while the vegetable protein conditions and reduces split ends. This shampoo gently cleans while effectively restoring healthy strength to weak, damaged tresses. The thickening properties of biotin and vitamin B5 revitalizes your hair’s elasticity and the ginseng and lavender extracts help repair the split ends. Hair looks healthier and grows stronger. Here is a natural restorative shampoo that cleans gently, yet restores healthy strength to weak, damaged tresses. The thickening properties of biotin and vitamin B5 revitalizes your hair’s elasticity and the ginseng and lavender extracts help repair the split ends. Hair looks healthier and grows stronger. This shampoo renews and replenishes your curls with B vitamins and nutrient-rich botanicals. The Biotin Repair Shampoo strengthens and restores the lost moisture back to your tresses and give your fine, thinning hair back its fullness. Get a healthier scalp with the invigorating citrus rain scent. A hair thickening shampoo that is rich with biotin, keratin, protein, and cysteine nourishes your hair and scalp. This shampoo is gentle enough for daily use. Here is an all-natural, organic hair loss treatment of many chronic scalp conditioners. The gentle formula consists of argan oil, B vitamin complex, biotin, nettles extract, saw palmetto, and he shou wu. Here you get your hair follicles get nourished and healed to prevent future hair loss. This volume shampoo has lavender to gently stimulate the hair follicles and increase blood circulation. The biotin b-complex infuses essential protein for the thickness and fullness we desire while improving strength, texture, and manageability. A shampoo to thicken, strengthen and volumizing thin, fine hair. The biotin strengthens your hair and the baobab oil will fortify and strengthen your tresses. This shampoo does not contain sulfates, parabens, phthalates, paraffin, or gluten. Yes, we’ve even got something for the men! This invigorating shampoo formula will leave your hair ultra-clean, shiny, and easy to manage. Body and fullness will be restored to fine hair. With the shampoo you get to be eco-friendly, as all of the ingredients are biodegradable.